By Angie Drobnic Holan on Monday, July 2nd, 2018 at 3:10 p.m. The letters were clever forgeries, but they dogged Washington. They circulated in pamphlets, during both the American Revolution and Washington’s presidency -- until Washington grew tired of hearing about them and issued an adamant fact-check of his own. Whoever forged the letters worked to make them believable, including details about Washington’s life as a Virginia farmer. When the letters first appeared in London in 1777, they were published with a preface claiming they had been found when Washington’s enslaved servant, William "Billy" Lee, was captured. Lee worked as something of a "body man" to Washington, even accompanying him on horseback when Washington was out in the field with his troops. The forgers claimed that Lee had letters in a briefcase when the British captured him. "The arts of the enemies of America are endless, but all wicked as they are various. Among other tricks they have forged a pamphlet of letters entitled ‘Letters from Gen. Washington to several of his friends in 1776.’ The design of the forger is evident, and no doubt it gained him a good beef steak from his masters. I would send you this pamphlet if it were not too bulky for the post, as it might serve to amuse your leisure hours during the inaction of winter." Like any target of a fake news attack, Washington must have wondered if responding would just bring more attention to the phony reports. 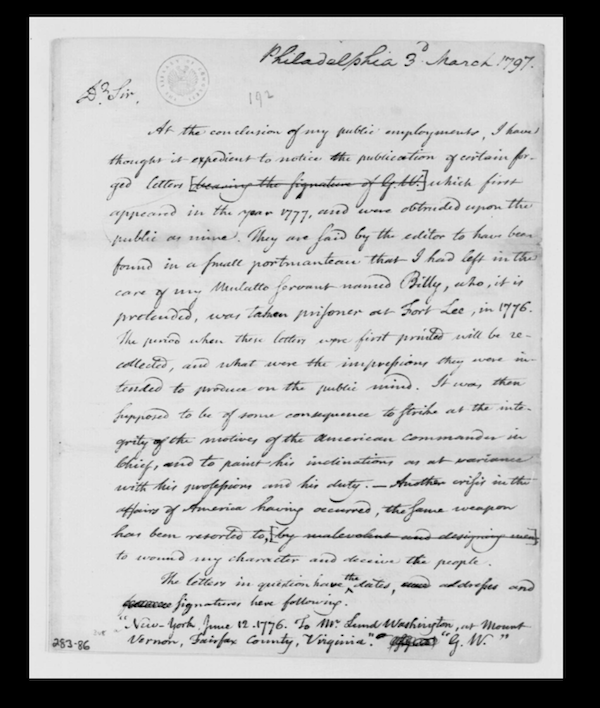 Washington seems to have ignored the letters for the most part during the revolution, until they made another appearance toward the end of Washington’s presidency. 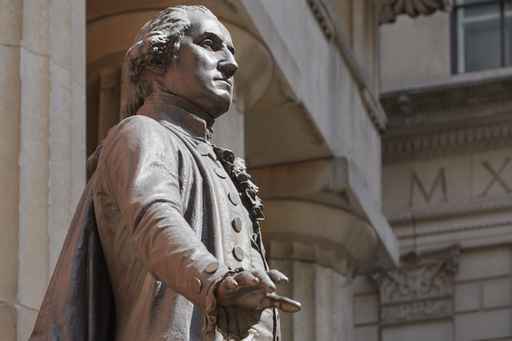 In 1795, Washington was urging the Senate to ratify the Jay Treaty, an agreement created by Alexander Hamilton that normalized trade with Britain now that the war was over. Some didn’t like the treaty because it was too friendly to an old foe. Others disliked the presidency itself and thought it was too much like a monarchy. Washington, in their view, was acting like a king. The fake letters confirmed what these critics already thought, that Washington didn’t care about democracy and was abusing his power. "They are said by the editor to have been found in a small portmanteau that I had left in the care of my mulatto servant named Billy, who, it is pretended, was taken prisoner at Fort Lee, in 1776. … At the time when these letters first appeared, it was notorious to the army immediately under my command, and particularly to the gentlemen attached to my person, that my Mulatto Man Billy had never been one moment in the power of the enemy. It is also a fact that no part of my baggage, or any of my attendants were captured during the whole course of the war." Washington noted that he didn’t feel a need to publicly rebut the letters during the war, but now that he was leaving the presidency, he felt called to act, if only to assert a simple truth: "I have thought it a duty that I owed to myself, to my country and to truth, now to detail the circumstances above recited; and to add my solemn declaration, that the letters herein described, are a base forgery, and that I never saw or heard of them until they appeared in print." William Ferraro, a senior associate editor with the University of Virginia’s Washington Papers project said the fake letters were not particularly unusual for their time. Many politicians and writers schemed against each other, and pamphlets were a common format to use when making attacks on opponents. Rumors and innuendo ran rampant. What’s more, the unity and idealism of the revolution, the spirit of 1776, had gradually dissipated over the years. By the time Washington was preparing to leave office in 1797, political parties and extreme partisanship had begun. "It got Washington incredibly upset. It was one of the major reasons he wanted to leave politics. He was fed up and wanted to go back to Mount Vernon and take care of his farm," Ferraro said. Today, fake news takes the form of online posts, chain emails and snarky comments on Twitter. But the sentiments that drive fake news go back a long way. "Now with social media and electronics it can explode so quickly," Ferraro said. "But skullduggery itself has a huge history in American annals."